This new campus explores the formal interaction of buildings and landscape, at once focused expansively outward and inwardly on an elliptical central green. Other building includes include West Hall and the Campus Center. Milas Hall is the heart of the College. Its complex program, including admissions, administration, faculty and staff of­fices, meeting rooms, library, IT center, and 300-seat auditorium, brings students, faculty, administrators, and visitors together in a lively mix. A public presentation and display space forms the core of the building and overlooks the adja­cent Olin Oval. 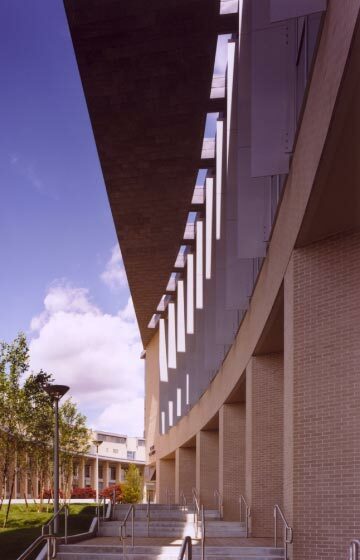 Multiple entries and a stepped section link various pathways, allowing the building to serve physically as well as symbolically as a campus crossroads. The combination of small and large program spaces calls for a range of lighting strategies. Calibrated overhangs and exterior fins control daylight and views for west-facing faculty offices while unscreened windows allows north-facing administrative offices to take full advantage of diffuse natural light. A large expanse of north-facing glazing combines with an overhead light monitor to light the building’s central function space. A large, sculptural shell diffuses light and provides visual interest to the space below. The Academic Center responds to evolving teaching methods by providing highly flexible, highly wired classrooms, laboratories and faculty research areas. Classrooms are large, with integrated services and corner slot windows that let in daylight while maximizing usable wall surfaces. Multiple furniture configurations are possible, as are multiple teaching arrangements: each room incorporates dimmable lighting, a variety of wall surfaces, and accommodation for a range of projection, teleconferencing and wireless equipment. 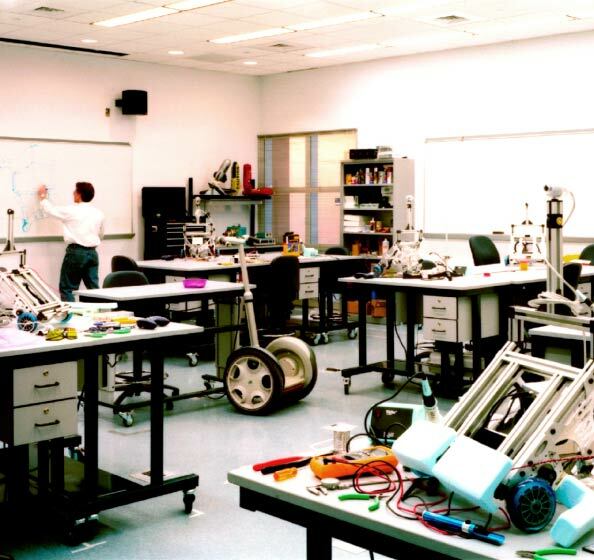 Laboratories are similarly flexible, anticipating future space reconfiguration and redistribution. Flexibility is critical for long-term sustainable planning. With institutions in a constant state of flux, campus buildings are most sustainable when they anticipate future changing needs. The Academic Center contains 28 teaching spaces whose design allows a variety of uses and modifications. Each space incorporates demountable wall systems, multiple instruction walls, oversized doors, underfloor air delivery, floor box grids, and demountable risers.